Are you new to deer hunting? Do you want to expand your hunting season? Want to save money by hunting your food? Are you an experienced archer that wants to challenge yourself even further? Do you feel left out when all your buddies head out into the woods with their Recurve bow or compound bow and arrow in hand and leave you behind? Here we are going to explain to you how to hunt deer with bow and arrow. Bow hunting is one of the ancient sports and dates back as far as 25,000 BC. Hunting deer by bow & arrow is a rewarding sport that requires exceptional aim, unwavering patience, and impeccable skill. Bow & arrow hunting can be more challenging than rifle hunting because the deer needs to be closed to your for you to shoot and kill it. While range can vary due to certain circumstances, a bow hunter’s shot is restricted to 2.3 yards to 42 yards. Are you an expert archer? Before trekking through the bitter cold into the woods in late fall/early winter, use the warm summer months to practice, perfect your archery form, and hone your archery skills. Where do the deer live? Learn where the deer are and what type of environment they prefer to gather in. * Deer tend to roam in dense areas where it is difficult for humans to travel such as dense cedar thickets or old swamp land. * Bigger bucks tend to camp out in shady, high altitude places. One you have decided where you are going to hunt, it is crucial to scout the area. Scouting does not mean going out a few weeks prior to bow hunting season. As bow hunting season approaches, deer are on high alert. Start scouting as early as August to find out where the deer are and scout that area often to track their habits. *Leaving a trail cam, or several, in or near your tree stand will help you find the best deer bow hunting spots. * Bait the area you plan to hunt. Corn, apples, and carrots are excellent choices that deer like, This will remind the deer they are in a good territory and encourage them to stay. Be aware of baiting laws and stop baiting about ten days or so prior to hunting. Know when to hunt and come up with a plan before you head into the woods. What is your goal for the day? * You should have more than one tree stand. ***The range you have when hunting with a bow and arrow is limited. Your tree stand should be within 20 yards or so of the area(s) you want to hunt. ***Your scent does not immediately dissipate, it lingers for hours or days. Change up your position to surprise the deer. *Plan the time of day you are going to hunt and which tree stand you are going to hunt in that day. *Create a schedule – f you are hunting with others, set a time and place to meet. Want to know how to increase your chances of getting a deer? Here’s the bug secret – You are not going to get a deer if you are not in the woods! *The more time you spend in the forest, the greater your chances of getting a deer. Get out there early in the morning and stay until late morning. Bow Hunting early in the season will increase your chances of getting a deer better. *Because you scouted early, you have an advantage over lazy hunters that waited until the last minute. You already know where the best places to hunt are, but they don’t. * The more hunters there are in the area, the greater the chances of the deer in the area getting spooked and moving away to more desolate areas. * Shooting a bow and hunting arrow is easier and more accurate when in the standing position. (3) If you are sitting, stand up while the deer is still far enough away and try not to make any noise or draw attention to yourself. * Your goal is a one-shot kill. To kill a deer, you need to hit the deer’s vitals. Aim your arrow to the right, behind the front leg, aim for the neck, or aim for the brain. You did everything right and shot your first deer. Now, what? * Do not follow or look for the deer right away. Start looking for the deer as soon as you feel it is dead; waiting for approximately fifteen to thirty minutes should be sufficient before following your deer. Following too soon may make the deer retreat further into the woods, and this will provide the deer time to lie down, bleed out, and die. *Do not wait too long or you may forget where the deer went. While you want to give the deer time to die, you do not want the precious meat to spoil. As soon as you think the deer is dead, you can start tracking it. * If you cannot visibly see the deer, track the deer by following its blood trail and signs that a deer just ran through there. * Once you have found your deer, ensure that he is dead and drag him out of the woods. You may need an extra set of hands for this task. * You did all the work and found the perfect bow & arrow deer hunting spot. Others were lazy and didn’t put any effort into finding an excellent spot to hunt. Don’t give away your secret spot. If a deer knows you are in the area, it will be on high alert. Use these tips to become invisible to the deer around you. A hunting license is required to hunt with a bow and arrow for deer. You can purchase your hunting license online at your local DEC website or one of many sporting goods stores. * Your hunting license will have all the information you need to hunt including deer season dates, how many deer you can and, what kind of deer you can tag. Deer need to drink water to survive. Find the buck trail(s) leading to the water source and watch and wait. *You may become impatient and give up. Remember, if you are not in the woods, you can’t get a deer. 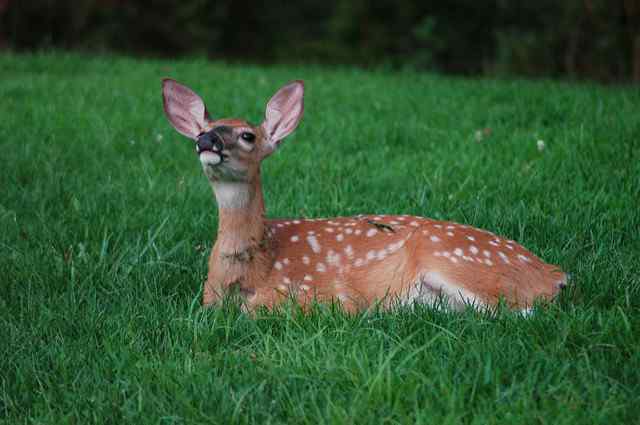 *Becoming fidgety and moving around will create rustling sounds that will scare deer away. Moving around a lot will also emit more of your human scent that will give your hiding spot away. *Taking the shot too soon can result in you missing the deer completely, alerting other deer in the area that you are there and scaring them away or hitting the deer but missing the vitals and it taking off to suffer a long, slow painful death. Learn everything you can about deer. * Learning about deer habits, life cycles, movements, body languages, likes, and dislikes will help you become a better, more informed, efficient hunter. Pack your back a day or two before you go into the woods. Be prepared with all the proper equipment you need to hunt and kill your deer. Driving then walking miles away only to find you are missing a crucial piece of equipment can run your day of hunting before it even started. * You will be in a tree stand at least 20 yards from your target. A pair of binoculars can help you see further and improve your focus. * Bring a backpack or fanny pack to carry all of your essential items. This will ensure you don’t forget anything; nothing accidentally falls out of your pocket or hand while walking or waiting in your tree stand, and your hands are empty and ready for you to grab your bow and shoot. * Deer cannot see color well, so a neon, bright orange piece of clothing will not make you stand out, It will, however, stand out to other hunters. * Because you are going into and leaving the woods in the darker dawn and dusk hours, bring a fluorescent light to help maneuver your way through the woods. This will also come in handy when you are tracking the deer you shot.